Charles Dixon RI (1872-1934). Watercolour signed and dated 1911 and annotated in the artist's hand "Victory firing the Coronation salute". 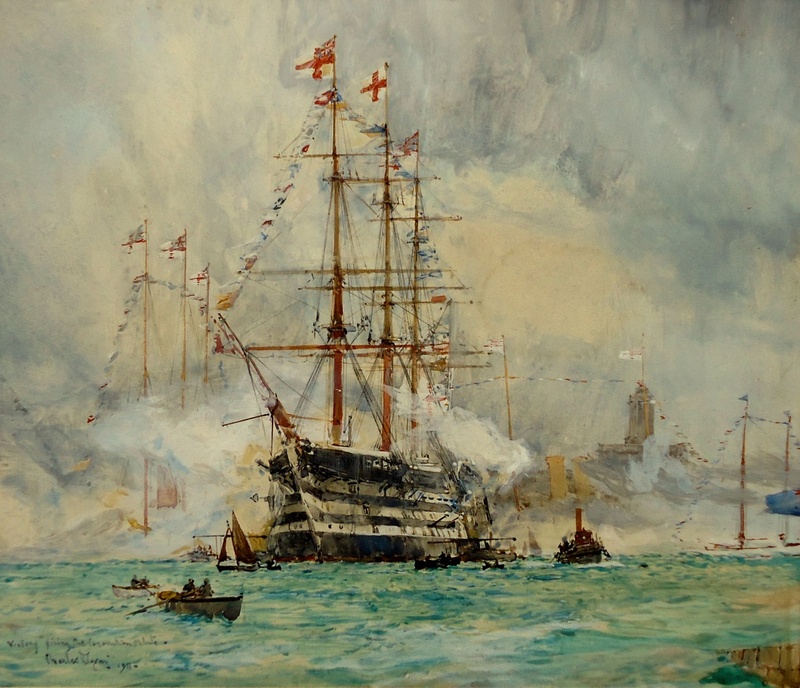 HMS VICTORY (Captain J de M Hutchison CVO CMG) wearing at the main the flag of the Commander-in-Chief Portsmouth, Admiral The Hon Sir Assheton Curzon-Howe GCVO KCB CMG, decorated with bunting and wreathed in smoke as a Royal Salute roars out on 24th June 1911, HM King George V's Coronation Day. Dixon has achieved a watercolour full of drama and excitement: billowing smoke emanating from VICTORY and other warships in the dockyard and out in the harbour as they fire their saluting guns; the fluttering bright bunting flown by all HM Ships who are dressed overall for this most special of occasions; small boats, sailing boats and every manner of craft joining in the fun of it all; and in the background and awaiting her turn to wear the Royal Standard of the newly crowned monarch, we see the the unmistakable twin buff coloured funnels of His Majesty's Yacht VICTORIA & ALBERT who is berthed at South Railway Jetty which lies beneath Semaphore tower, also visible, sporting a massive white ensign of the Royal Navy. VICTORY is shown here still moored out in the harbour at Portsmouth and it would be some 10 years before she would be allocated a dry dock and given a permananent berth where she would stand a reasonable chance of being preserved. Nearly a century later this is proving harder than perhaps envisaged back in the days when money was being raised to preserve her by bringing her into that dry dock and lending her hull physical support, and 2015 sees another expensive restoration project underway to try and keep this iconic old wooden wall, in reasonable condition. It has to be worth it!